School’s out! So parents get ready for the repeating of “can Tatum spend the night?”. So be prepared and read some of these sleepover tips to make those spend-a-nights as memorable as possible. Many parents wonder at what age is appropriate to have a sleepover or go to one. Many suggest 7 years is a good age if you know the child and parents well. Others feel 9-10 is a good beginning. Start small then go from there. Have one child at a time for the first few sleepovers then if you and your kiddo are comfortable then add some more. Remember, group dynamics are vastly different than one on one. If you have more than one for that slumber party, make sure there’s no “ganging up” going on. Monitor them and make sure. Make sure they have everything they need prior so they’re comfortable at your house. Whether it’s their grappie pillow or fluffy blanket, make sure it’s with them. And make sure they have the essentials such as toothbrush and PJs. Have games and activities ready and available but not expected nor mandated. If they want them then they’re there and ready. Be prepared to feed them. They’re guests so feed them and do so on a timely manner and in a healthy manner. And have a nice dessert or treat for them afterwards. As long as parents say OK. But do it after dinner. No sugar one hour before bed time. And make sure to feed them a good breakfast. You don’t want the parent picking up a hungry child. That’s kind of rude. Pick a pick up time for the next morning so both sets of parents know how to schedule. Usually 10 or 11 AM is a good time. Make sure to have their parents cell phones programmed in case the child gets homesick or sick. And communicate that to the parents so both know and have contact information. Sleepovers are indelible memories for the kids so make sure you make the best of them. Sacrificing some of your sanity, space, time and effort is well worth it especially when you hear them talk about those nights when they’re home for the holidays with their children (your grandchildren) talking about those nights. It’s time to clean out the garage! Shop RTO is on a cleaning rampage with a series of spring and home cleaning articles. Phase one was about purging unwanted items to donate to charity. Phase two was about deep cleaning of your rooms and kitchen. This one is about your garage and/or storage shed. The first and one of the hardest thing you have to do is remove everything and put them outside. That serves two purposes. Forces you to consider the need of the items thus whether to throw them away and allows you to clean the floor. Clean the floor and begin to organize and purge. When it comes to organization think shelves and hooks. The ability to store and hang items is an incredible and efficient way to use space. So if you don’t have adequate shelving then get some. Make sure they’re sturdy and durable. The metal ones that allow you to stack as many as need can be the most efficient. They allow you to customize the shelving according to your space. When stacking just make sure you put the lightest and least used items at top and go down from there on the heaviest and most used. When installing hooks on the ceiling to hang bicycles, yard equipment, seasonal items make sure you screw them into the beams to secure them properly and safely. You may want to have a professional do so if you go with the hooks. The garage and storage sheds tend to be for those seasonal items or archives. If they are paper archives, go through them and if they’re seven years or older then throw them away. If they are photos or archives you need, consider scanning them and having them in your computer. Make sure you have them backed up on a different hard drive though and in the cloud. You need to have them in three separate digital locations. You might have to hire your child or a kid in the hood to do so as that can be a time consuming but well worth the effort. For those items you didn’t donate in phase one of spring cleaning then use the 1-2 year system. This does not include tools. But if you haven’t used items in the past 1-2 years then throw them away. Many times they are large items which means you’ll have to find a friend with a truck or hire one. Or if you’re city has a bulk item day, coordinate your garage cleaning around that day. When you’re ready to start putting back the items in your newly cleaned garage that will be the real test of whether to keep the items or not. It’s a pain but is the best keeper test you can conduct. You may also consider having a garage sale if you have items that are still of use but you don’t need them and want to make some extra change. Cleaning the garage is a day long or weekend long chore but well worth the effort. It frees up room and removes the stigma of being one of those hoarders. Just another Shop RTO lifestyle tip. 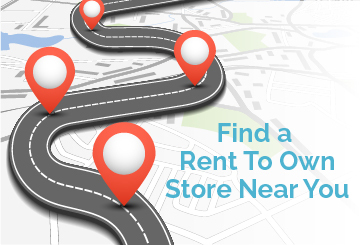 ShopRTO provides consumers lifestyle tips and when rent to own fits your home decorating needs. It’s summer cleaning time which means it’s time to donate all of those items you don’t use but are still in great shape. It’s that semi-yearly or yearly time to go through your home with fine tooth donating comb. And it’s always time to help those families who would be more than happy to use those gently used items. Go through each room on the quest to donate. You can also use the time do a little cleaning as well. In the bedroom, go through each drawer and each item in the closet. Find those clothing items you just don’t use and put it in a box dedicated to clothes. After purging dust the floors of your closets and wipe down each drawer. You’re taking clothes out so use the time to clean those spots. If you have kids then it’s definitely time. Kids grow up and out of toys and clothes. And less fortunate kids who are younger need them. Go through their closets, drawers and under the bed to find all of those dusty but still very usable toys that will get played with. The toys and children will appreciate it. Think “Toy Story” and you’ll be motivated to do so. The kitchen is a little trickier. Look at those items you just don’t use and many times it will be because their duplicate items. Put those items in another donation box. Go through your garage for one purpose. To donate. What you’ll probably find are boxes ready to donate that you placed them prior. Books. It’s time to donate all of those books that you have read. You’ve read them already so let someone else who may not have the extra money to spend on books but still needs to activate the mind through a good book. Many families count on donated items to keep their budgets in check and their lives and homes fulfilled. So, no waiting, and do some donating now. Just some more Shop RTO home lifestyle tip. Liven up your home this Spring. Punxsutawney Phil did not see his shadow this Groundhog Day so that means it’s time to dive in and welcome Spring into your home. Here are 4 easy ways to transition your home from Winter to Spring. Add a pop of color. Whether you want to take on a painting project or simply swap out Winter décor for lively colorful Spring décor, a pop of color can really transform a room. Something as small as colorful throw pillows or fruit baskets atop kitchen counters as a centerpiece is really all it takes. Here is this years Spring color palette to help get some inspiration flowing. Showcase natural light in your home. Now that Winter is out the door, replace your heavy drapes with lighter curtains and let the sunlight fill up your home. Replacing heavier curtains with translucent curtains doesn’t necessarily mean your energy costs will go up. Look for sheer curtains that let light shine through while also providing insulation which will in turn help you save on energy costs. Bring some of that Spring outdoor greenery inside with an indoor plant or two. Plants are an easy way to add some color into your home and the good news is, you don’t have to have a green thumb to keep an indoor plant thriving. Today Home has a great list of The 15 easiest indoor house plants that won’t die on you. Toss the smell of Winter, literally. Store or get rid of candles and fragrances that are reminiscent of colder months such as: pine, cinnamon, pumpkin, sugar cookies, you get it. Bring in some floral or light scents like lavender, floral or citrus. If you want to go the extra mile, showcase fresh flowers. Not only will they smell wonderfully but they’ll double as a pop of color in your home. Go on and transform the interior of your home to match all of the vibrancy that Spring has to offer. Just another ShopRTO home decorating tip. Easter meals can be a special treat for the family so prepare now to wash your formal table dinner linens, table cloths and napkins. If they’ve been in the drawer since last holiday or a special birthday then they’re dusty, wrinkled and probably has that smell that they’ve been in the drawer for too long. You can always take them out and send them to the dry cleaners. If you do, make sure they specialize in high-end fabrics. Remember, though, dry cleaning for items like these can be expensive. Especially if you have a large table, family and guests sitting down for the meal. If you’re like most of us, you’ll want to save money and do it yourself. Here are some tips for making your formal dining room table linens ready for the holiday guests. Take the table cloth off the table or drawer and shake clean. If it’s been on the table, there will be crumbs or even candle wax. Out of the drawer, it’ll be somewhat dusty. If there is candle wax, peel it off. If you can’t peel it off, use the hottest water the cloth will allow but just on the spot. With linen, warm water is what you use. Inspect closely for spots. Stretch out the table cloth and napkins to be able to review the entire piece. If you see spots then spot clean with a tooth brush, warm water and a small amount of detergent. One-fourth detergent to a cup of warm water is the formula. If you’re green, use vinegar instead of detergent. Don’t spot clean as it will risk spreading the stain. Gently scrub or wipe just the stain with a toothbrush. When using the washing machine, the best is to clean the table cloth and corresponding napkins by themselves. Especially if they’re linen. Use warm water and dish soap. Try to dry naturally. If not, be ready as soon as the drying is complete to prevent wrinkling and a potential lengthy ironing chore. If your table cloth and napkins are not linen. Treat them as regular wash. Make sure you wash with similar colors of other fabric and if they’re white, use a little bleach to brighten them up for the event. As soon as they’re clean, dried and ironed immediately put on the table or fold nicely. If it’s the table cloth, keep the fold loose. If it’s the napkins, keep the fold tight. Ultimately, though, the point of this article is to remind you that cleaning your formal tablecloths and napkins need to be done in the next two weeks so you can have that chore done to spend on the dozen of other chores to prepare for the holiday guests. How to build a one-of-a-kind Easter basket. Easter Sunday is approaching and if you know or have any children who are hyped about the annual Easter egg hunt, consider gifting them an Easter basket this holiday. When I was kid I always looked forward to receiving a basket, going through all the fillers and then eagerly waiting for the green light for the much anticipated Easter egg hunt. If you plan on gifting an Easter basket you have two options – you can purchase a pre-made basket or you can make one yourself. Creating your very own Easter basket provides you with the opportunity to personalize the gift, making it extra special. Another great part of making your own Easter basket is that it lets you determine how much money you want to spend. So, if you’re looking for an inexpensive gift, this is it. First, you’ll need a basket. You can find a variety of baskets out there and it’s likely that most stores are stocked with baskets this time of year. Try your local craft store for inexpensive finds. If you want to go a different route than the traditional basket with handle, try a canvas tote. Kids might be able to hold a tote better over their shoulder than a basket. Using a tote will allow the recipient to use it for more than just an Easter egg hunt too! Next you’ll need some fun fillers. Think about what the recipient may be interested in at the moment – a certain Disney princess, cartoon character, snack, movie, etc. You can even go as far as making it a themed basket. This will also give you the chance to introduce something new to the recipient. Maybe there was a movie from your childhood that you adored and want to share it with them, include that DVD so you can it enjoy together. Easter baskets don’t have to be filled with candy, get creative and maybe toss a toothbrush with their favorite character on it instead. Or instead of chocolate bars try a package of cookie mix with a cookie cutter in the shape of a bunny or chick that allows the child to interact with an adult and have some fun. Fruit can also be a fun and healthy filler. Once you have all of your fillers, place them in the basket and see how much room you have. Remove items and fill the basket with Easter grass that can also be found at your craft store. Lay it along the bottom and arrange your fillers so they’re well presented. You can go the extra mile and wrap the entire basket with Easter themed cellophane or tie a ribbon bow to the handle. Whatever you decide to do, any child would be thrilled to receive a basket this year so don’t hold back and get started! Just another ShopRTO Lifestyle and Holiday Tip.